Whenever I'm looking for a quick dinner to make for myself after a long day at work, I almost always turn to an Asian stir fry! They're one of my favorite things to cook because they're a) super fast - less than 20 minutes, b) super healthy - high protein and lots of nutrients from the veggies, and c) versatile!!! - I can mix-and-match anything I might have in my fridge at the time. Not matter what I add, it's always yummy! 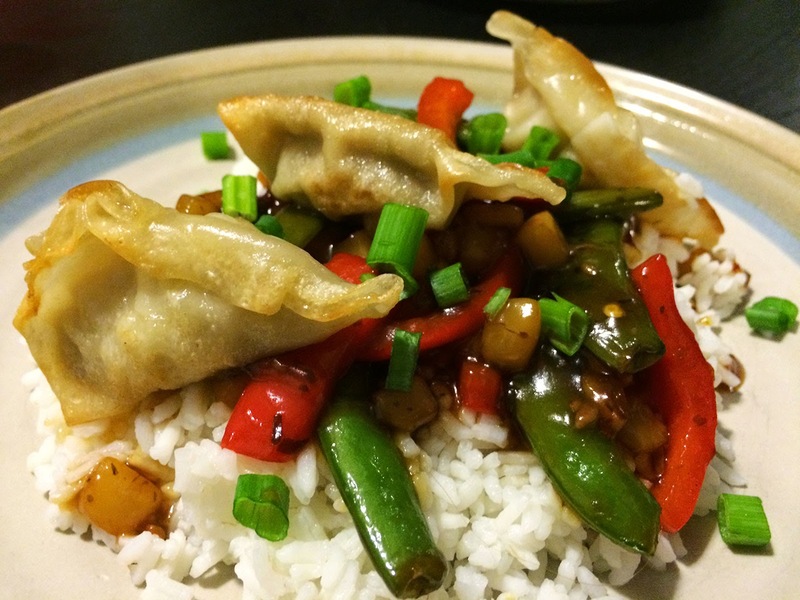 Last night, I had to stop at the grocery store after work for some ingredients, so I decided to put a spin on my usual chicken or beef stir fry with pork potstickers. Keep reading! I promise this recipe does not involve 3 hours of making homemade potstickers - or anytime time, actually. 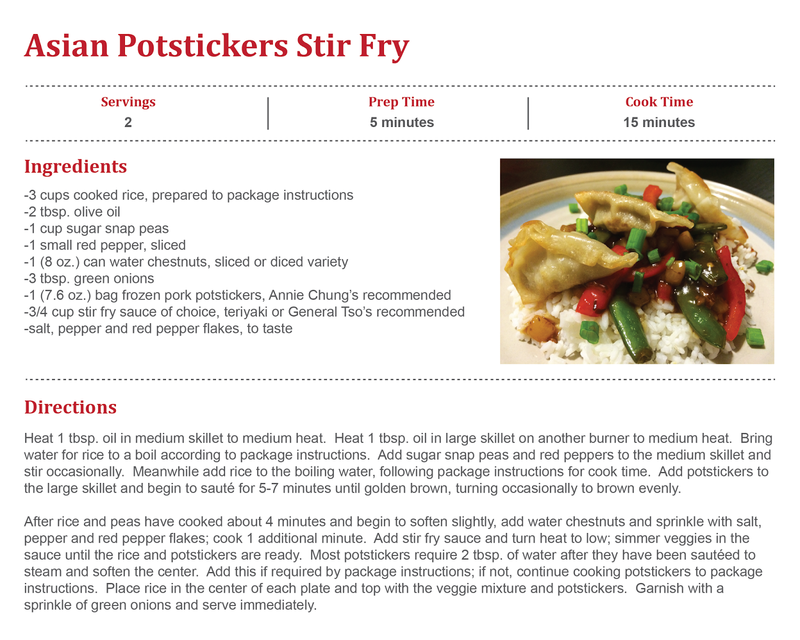 I totally cheated and bought Annie Chung's Organic Pork & Vegetable Potstickers, which are fairly low-cal and high-protein for a frozen food, and take less than 10 minutes to sauté to a golden crisp on your cooktop. Add some fresh sautéed veggies in a Korean Teriyaki sauce and serve everything over rice, and you have yourself an awesome and healthy Asian dinner for 2. I know all you health food fanatics...brown rice is better for you. I just like the softer texture of white rice better! You gotta try this! 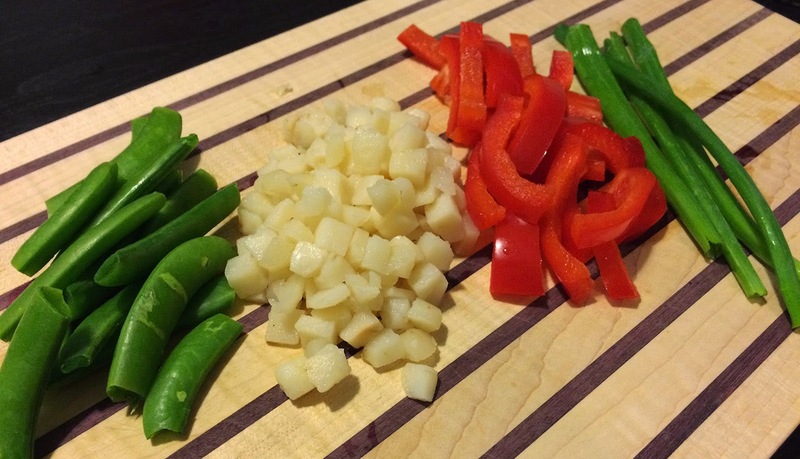 I started by washing off and chopping up some sugar snap peas, water chestnuts (can be found in Asian food aisle), red peppers and green onions. I threw the peas and red peppers in a medium skillet over medium heat and let them soften for about 4 minutes. 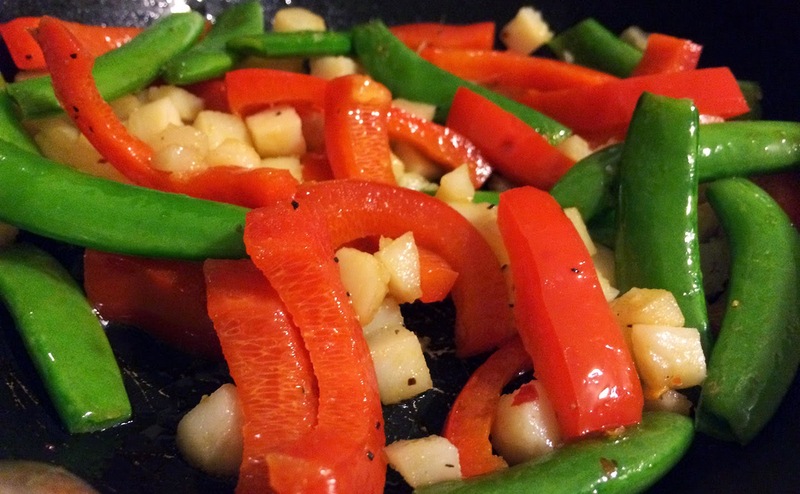 Once you place the veggies to the skillet, you have to really use those multi-tasking skills! 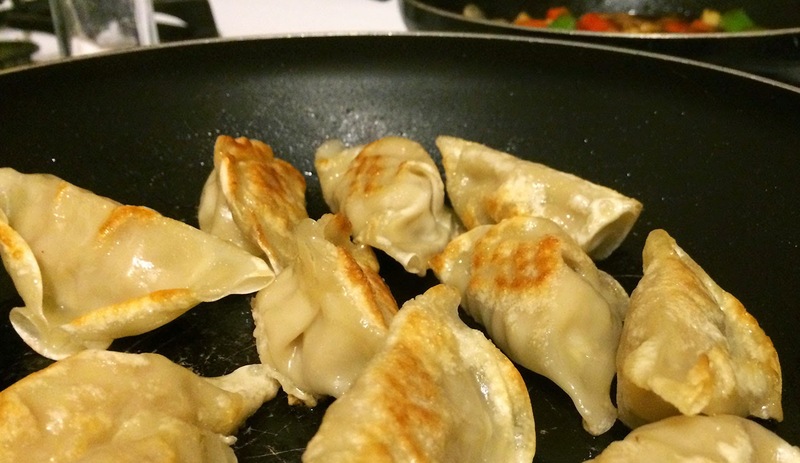 Start boiling the water for your quick-cooking rice and also start heating up a large skillet for the potstickers. Both the rice and potstickers are dependent on the package instructions, but my rice required 5 minutes of cooking after the water came to a boil, and the potstickers required about 8 minutes of sauté time. Be sure to read the instructions before you start cooking everything in case you need to time one of the components differently! Once the red peppers and peas started to soften, I added the water chestnuts since these do not need to soften much. 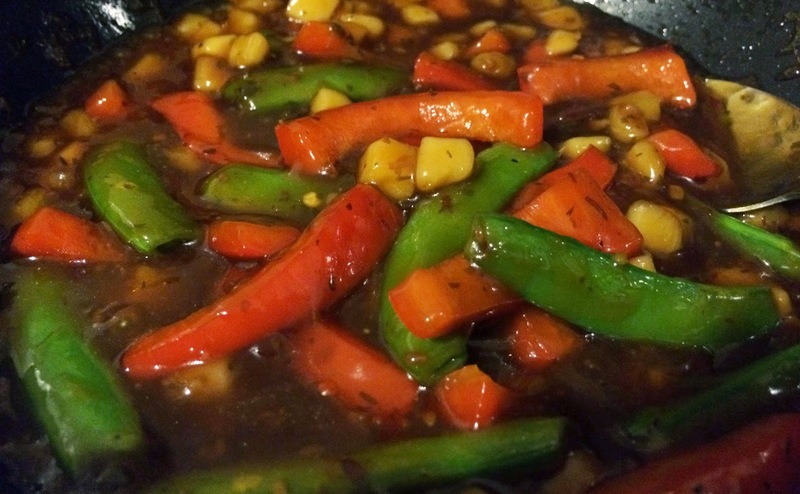 After the veggies were nice and soft, I added my Korean Teriyaki sauce to the skillet. Keep the burner on low heat to warm the sauce through; it definitely needs a few minutes of cook time for the full flavor to develop, but you don't want it to come to a full boil. Feel free to use whatever type of Asian sauce you like or have on hand...Howie said he wants to try General Tso's next time to add more heat, but I'm a a little wimpy when it comes to super spicy in every bite. I like getting hints of red pepper flakes in certain bites, but I need some recovery time in between! Once the rice was finished cooking, I put a big scoop right in the middle of the plate! I ladled on a big helping of the Korean Teriyaki veggies, and topped them with the crispy pork potstickers and a sprinkle of fresh green onions. It tasted just as good as it looked! So good that I definitely went back for 2 more potstickers immediately after I took this picture. Hey, I had to capture it when it looked it's best! Try introducing a little Asian flavor into your kitchen on one of your busy weeknights!